The luxury manufacturer HOUSE OF TAI PING still weaves some of its carpets by hand on old Jaquard looms. Modern design makes these carpets works of contemporary art. Captions : Bathed in light: The city palace in the Rue de Montalembert, Paris, is the perfect showroom for luxury carpets. 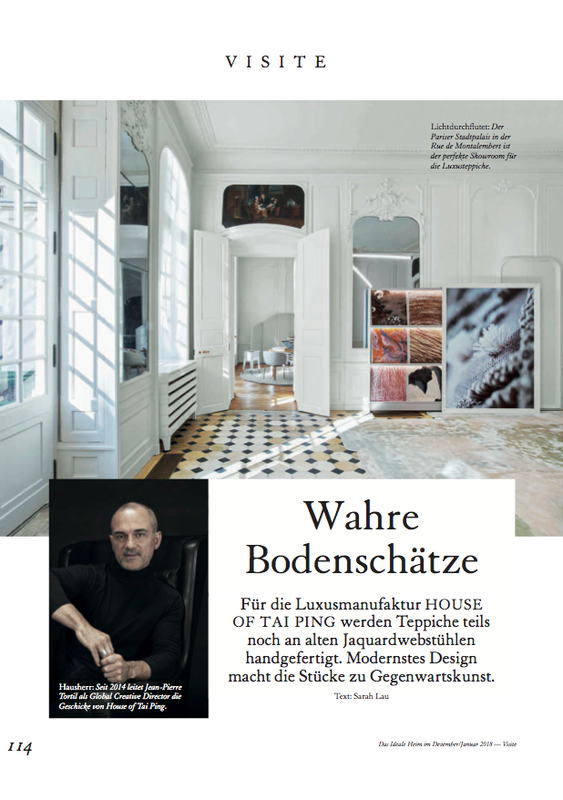 Master of the house: Jean-Pierre Tortil has been Global Creative Director at House of Tai Ping since 2014. History: Cogolin handwoven carpets once even covered the floors of Versailles. New splendour: The Cogolin workshop, established in 1924 near Nice, has been lovingly restored along with its 19th-century Jaquard looms. Unique: Making a Cogolin carpet on an old Jaquard loom requires about three months of work until it is finished. Entering the House of Tai Ping’s city palace showroom in rue de Montalembert, I am overtaken by a feeling of solemnity. Here lie magnificent carpets, the kind which one normally finds in private jets, on yachts, or in royal palaces. For two days I will be immersed in the world of luxury homes, and will travel from the company headquarters in Paris to the South of France to see the old Cogolin weaving mill. But first, I’m here on my knees. While Creative Director Jean Pierre Tortil explains how the carpets are tufted and woven according to Nepali hand-knotting techniques, I run my hands over silk, linen, wool, mohair, cashmere, Matka silk and – a new suprise, nylon! Tortil tells of the company’s origins as a Hong Kong foundation for refugees from Red China in 1956, established by Lord Lawrence Kadoori. The refugees’ knowledge of unique knotting techniques laid the cornerstone for the company’s success. Two pieces from the new «Scenematic» collection, by architect and interior designer André Fu, made a special impression on me. After collaborations with star designers like Patricia Urquiola and Alfredo Häberli, the Chinese interior designer and architect created a 13-part textile hommage to the silhouettes of the urban landscape. «The collection does not concentrate on a single object of a particular city. Rather, it represents a very sensuous, scenic experience», says Fu. «Skyfall III» and «Midnight Express» show a skyline by day and night in elegant blue tones, with alternating high and low reliefs giving them a three-dimensional effect. «Actually, what we are doing is haute couture », laughs Tortil, who has designed for Yves Saint Laurent, among others. «We, too, work with the finest materials and provide our customers with their own personal designer, who works to realise their own special visions.» Along with the brand extensions 1956 by Tai Ping and Carpets Inc (both use industrial production to meet the demands of large-scale projects), the House of Tai Ping includes the established US manufacturer Edward Fields Carpet Makers and the La Manufacture de Cogolin brand, launched in 2010. The latter is our next destination. And whoever comes to Cogolin, a small municipality near Nice, should stop in to see its former 19th-century silk mill. Here, work is still done on original-era Jaquard hand looms, says Sarah Henry, who runs the company today. Punched cards control the movement of the hooks, just like in the old days. The designs hark back to the 1930s and were made by Christian Bérard, Jean Cocteau, and Sir David Hicks, among others, for the Palace of Versailles and the Élysée Palace. I get a less regal but friendlier last look into the freshly-renovated workers’ break room under the roof. Behind tables strewn with bags of crisps and toast bread stands a treasure chest. To the unsuspecting observer it is nothing more than a white commode. Inside, however, are old photo albums, early designs, and even a letter of thanks from Karl Lagerfeld – who, multi-talent that he is, naturally designed his own carpet.